I’ve been looking and looking for some old vintage metal trays. I thought they would be cute with their inner sections painted in chalk paint. 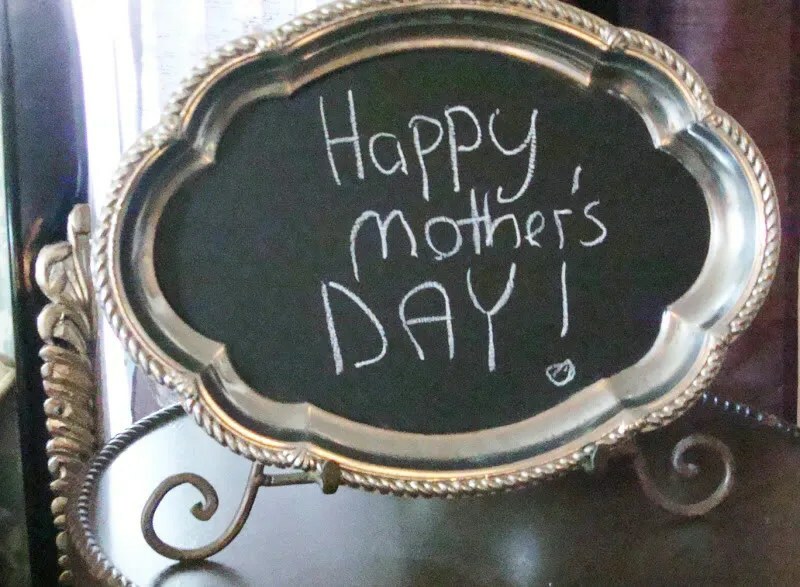 Cute to display around the home – handy for whatever the “Message Du Jour” is! Thing 1 and Thing 2 always have fun with things like these and there’s no telling what message someone might leave, tempted with a blank slate and piece of chalk! The weekend garage sales hadn’t turned up anything. My search of the local thrift stores turned up a few items that were too much money and just really not what I was envisioning. I was really looking to pay no more than a $1.00 (or even less). Are you familiar with “the Secret”? It’s a philosophy where you put a message out to the universe. Basically you manifest your desires. I’m familiar with the concept only. But I will tell you this, I do seem to have this gift! Need a new Cuisinart? I’ll find one, brand new at an estate sale for $25 complete with the extra blade set. What about a Barbecue for the rental house in Palm Springs? How’s $20 bucks sound, gently used with a filled propane tank to boot! Yeah, lucky me. This is my gift in life – it couldn’t be something cool like winning lotteries or finding diamonds. But finding that certain something that I feel I need… it comes to me. Sure enough, sooner than expected, someone moved out of one of the apartments where I lived. They left a bunch of kitchen goods, stacked neatly in a covered area next to the recycling. Three darling little vintage trays yelled out to me and caught my attention. They were not too big! Not too small. EXACTLY what I was envisioning! After cleaning up the trays and applying a couple of coats of chalk paint, I had three festive little message boards, perfect for any occasion! Naturally, Thing 2 was the first to grab the chalk and leave her message! Traditionally, I make a few things around the holidays. Most are for people that made it onto my Christmas list. But I have learned the hard way to be prepared. I prefer to avoid that “Oh Crap” moment which happens when someone unexpectedly stops by (especially when they have brought YOU a gift) or you get a last minute invitation and have no time to shop. So, while you are making the gifts for the ones that made the cut….make a few extra for back-up. I like to force Paper White bulbs. (I sound so brutal) My old house had a yard that blessed me with forced bulbs from the past. 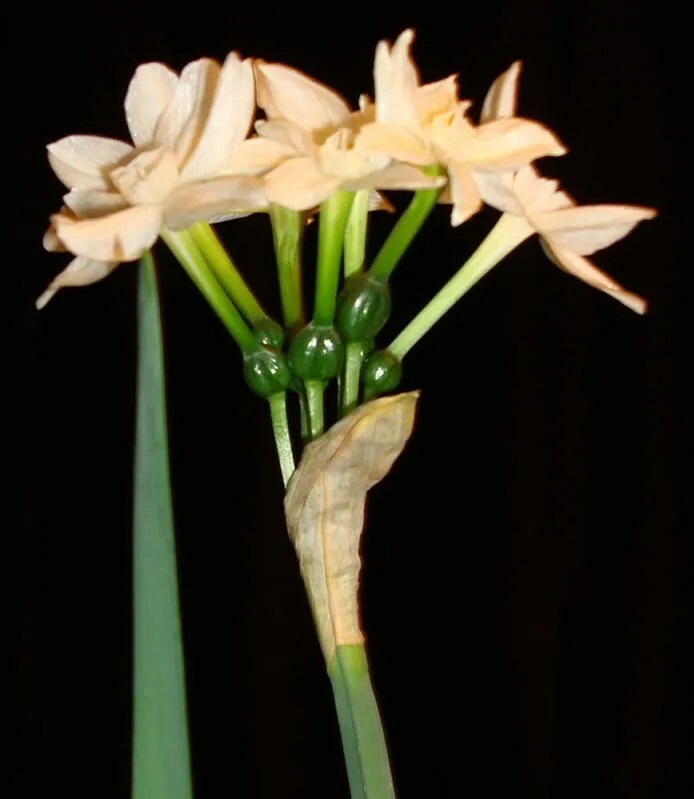 After the paper white bulbs have bloomed and grown, their leaves turn brown and it’s time to put them in the ground…. and forget about them. Two years later, they are popping up, on their own schedule and blooming fragrantly! 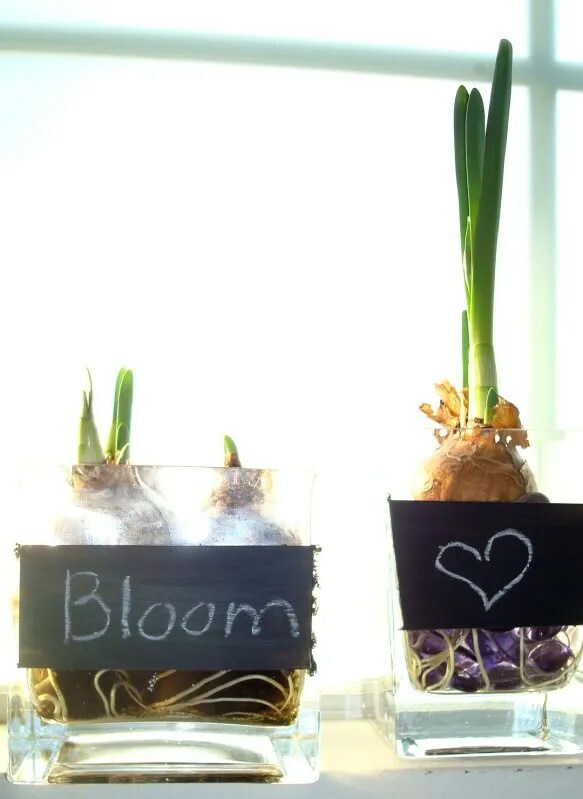 Paper whites are wonderful to give in small glass vases (I get them cheap at yard sales). Fill the vases with rocks, glass beads or decorative sand. 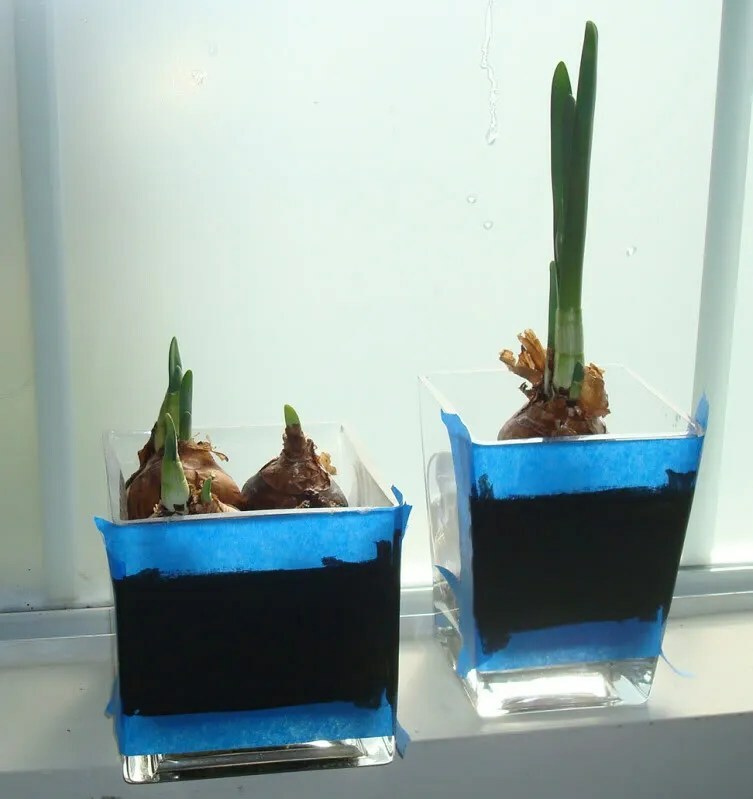 Position the bulbs so that they will stay secure on the top and add some water just to the bottom of the bulb. Their little roots will sense the water and start growing, and green stalks will be sprouting outward! 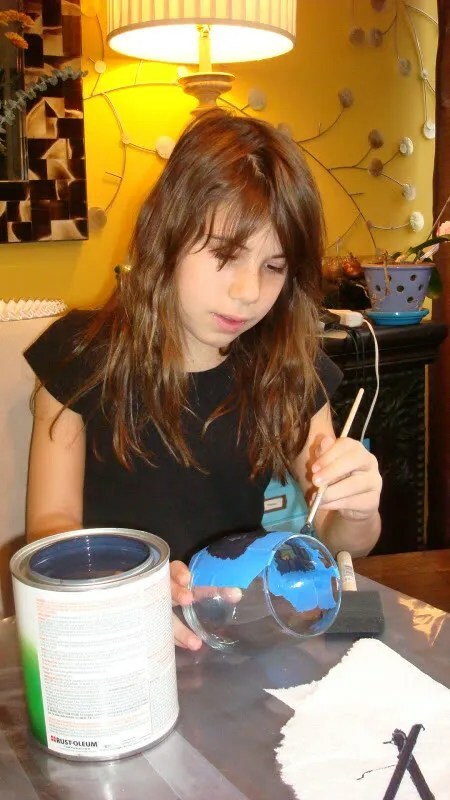 Everyone loves scented candles and you can have a blast making them with your kids. 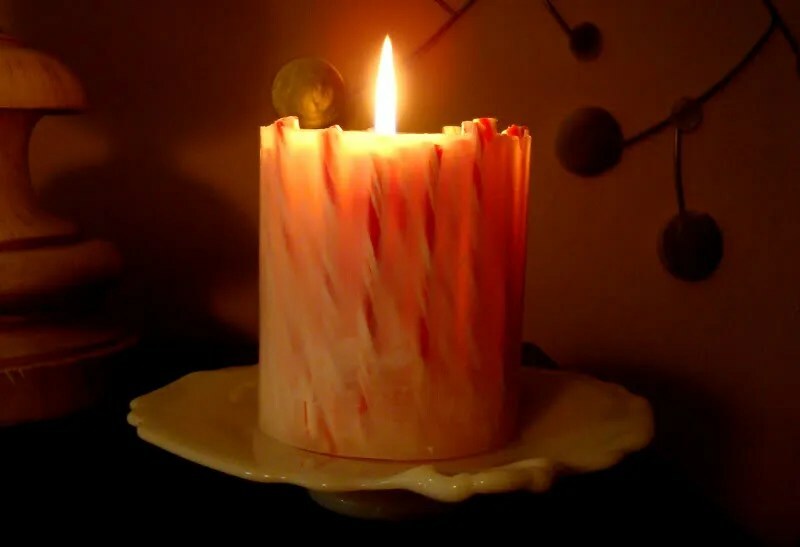 Last year, my daughter and I had fun making candy cane candles. Using two wax forms from ye local craft store we first filled the center candle form and scented it with the closest scent we could to peppermint (in this case vanilla, I couldn’t find peppermint oil for candles). Once this set up, we removed it from it’s form and then placed it in the larger form. This leaves a gap that we filled with peppermint sticks. Fill in the remaining void with wax. GORGEOUS! Get creative! We also used cinnamon sticks, cranberries & mistle toe. The most popular version was inspired by a friend who gave me a bag of coffee beans deemed “not worthy of drinking”. I had coffee scented oil and you could almost burn one instead of drinking your morning latte….ALMOST. These were very popular last year and I think we’ll have to make some more. 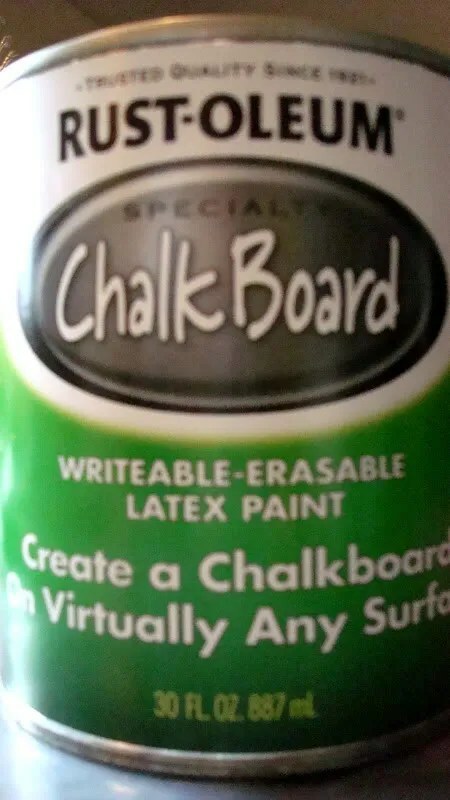 This year, as you know, chalkboard paint is all the rage. 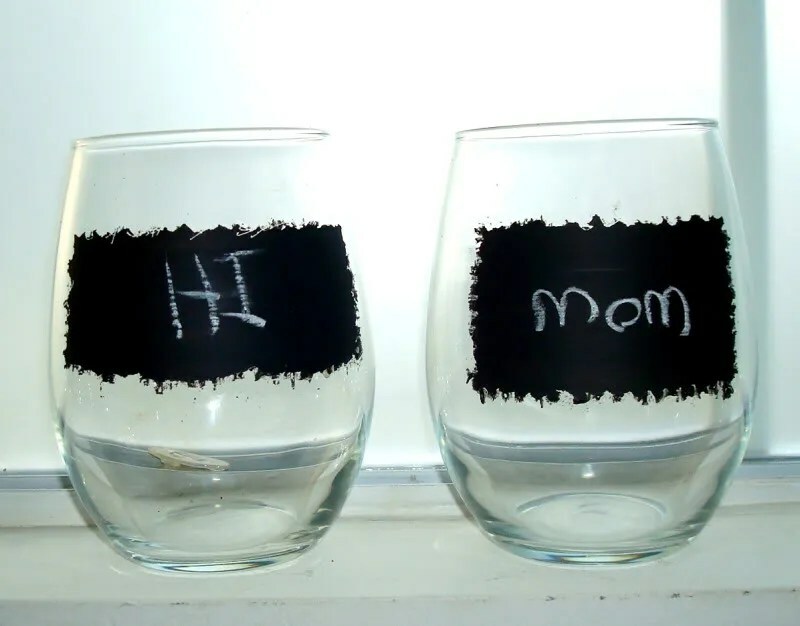 Have you seen those wine glasses in the stores with the mini chalkboard on them? You can write your guests name on them (or some other nonsense). They’re kind of expensive. Besides, I prefer the stemless kind. All the “real classy” wine drinkers (like my friends) use these because they’re easier to hold when drunk and less likely to spill. Then we applied the edged tape to the glasses lining up the straight side of the tape to the top rim so the “distressed” part creates the frame. Next we shook up our can of chalk paint, and painted the taped off section. Let it dry – and re-coat. 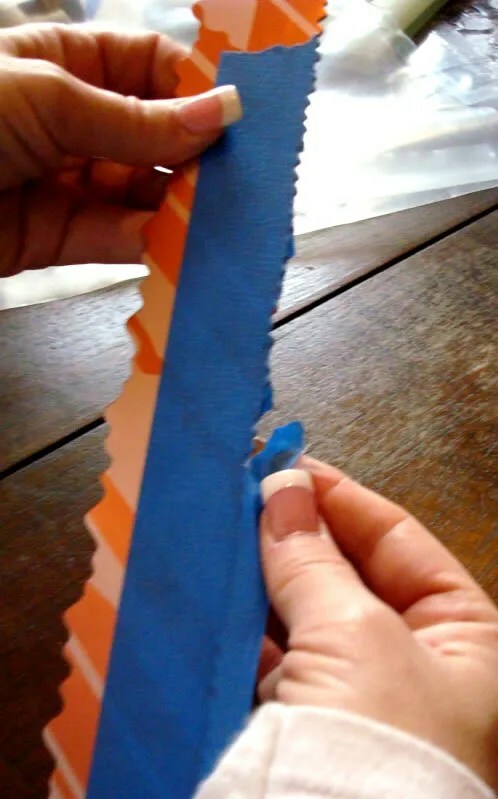 When it’s all dry – peel off the tape. 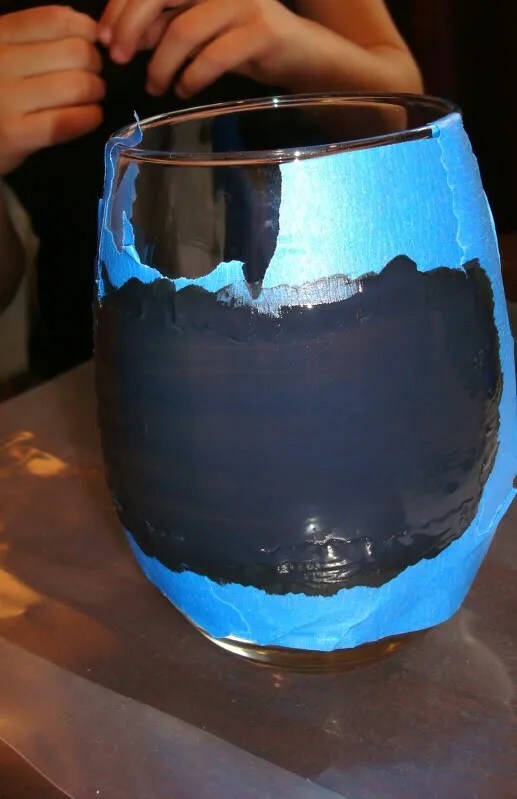 Any “oops” areas can be scraped off with a fingernail or xacto knife. Easy! I got a lot of satisfaction from this project but it was almost a little too quick… hmmm, what else could I paint? Spying the bulbs I’ve already started to force I found my answer! 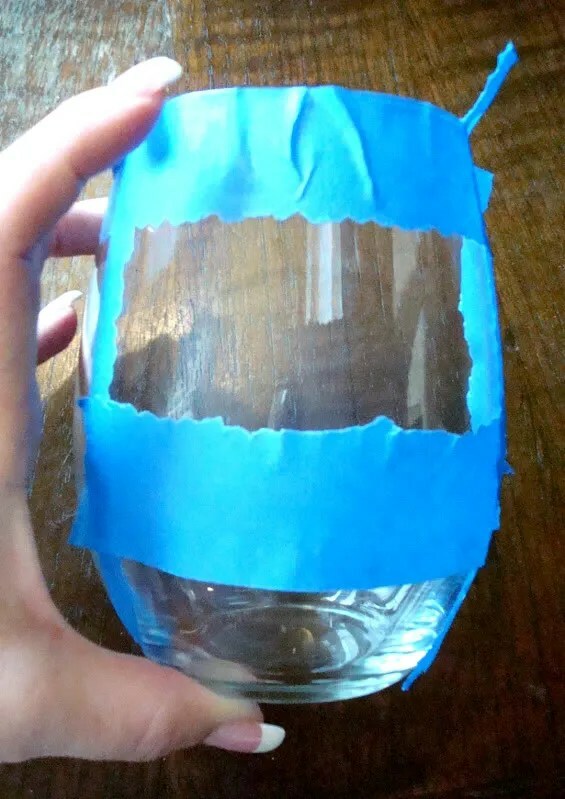 The vases were quickly taped and painted before you could say Narcissus! Cute!